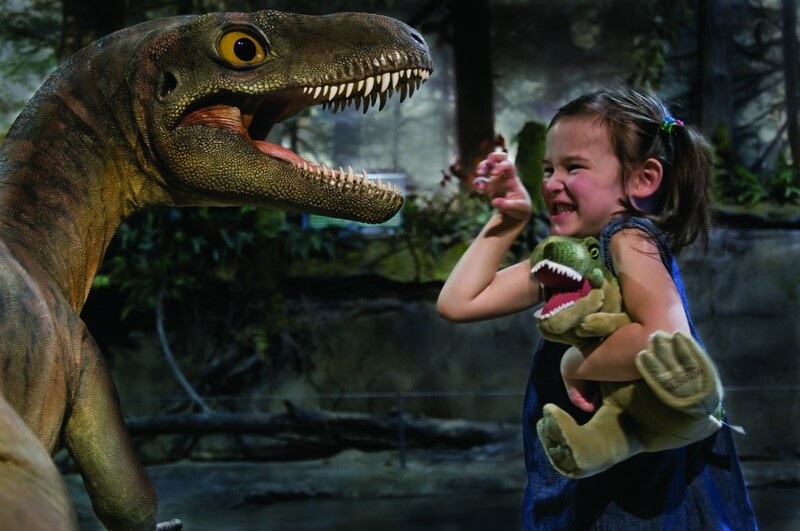 From the majestic Rocky Mountains of the Crown of the Continent to the deep sculptured river valleys of the Canadian Badlands, experience southern Alberta’s heritage and discover unique western landscapes. Walk through the Canadian Badlands where dinosaurs once roamed. 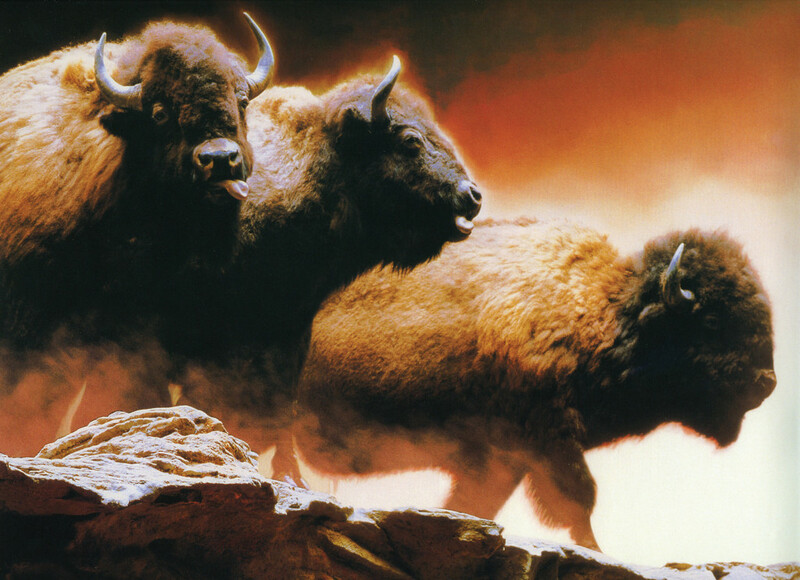 Learn how the ancient Plains People hunted buffalo for their survival. Hear the stories of early settlement, where horsedrawn vehicles and steam engines carried people and cargo across the prairies. Visit historic sites where North West Mounted Police confronted whiskey traders and brought law and order to the west. Discover how irrigation fostered agricultural production and how coal mining attracted settlers to the western frontier. Traveller note, if you book a hotel stay with Canalta Hotels noted on the map you will receive a free admission to one of the heritage attractions featured in this article. 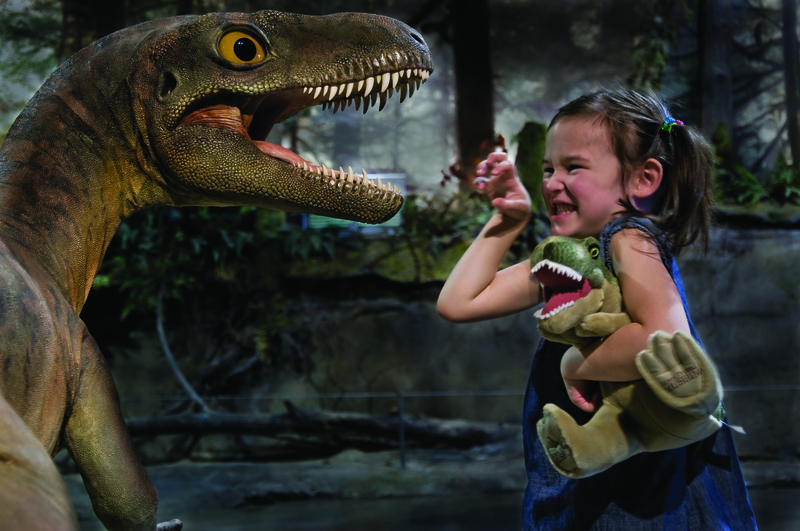 The cultural adventure starts in Calgary with stops at heritage attractions and then extends through the Canadian Badlands. First stop, at the confluence of the Bow and Elbow Rivers is where the North West Mounted Police built the fort in 1875. Fort Calgary National Historic Site tells stories of Calgary’s early settlement. 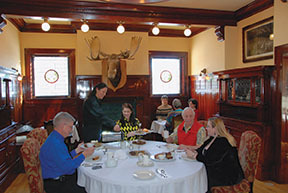 Next stop is the historic mansion Lougheed House National and Provincial Historic Site where you can enjoy an elegant lunch in The Restaurant at Lougheed House. Take your time to get to know the Lougheed family. From 1891 to 1936, the family of Senator James and Lady Lougheed with their six children called this magnificent sandstone mansion their home. Hear the amazing stories when this house was a political and social hub in Calgary. Be sure to explore the gorgeous gardens at this historic site. 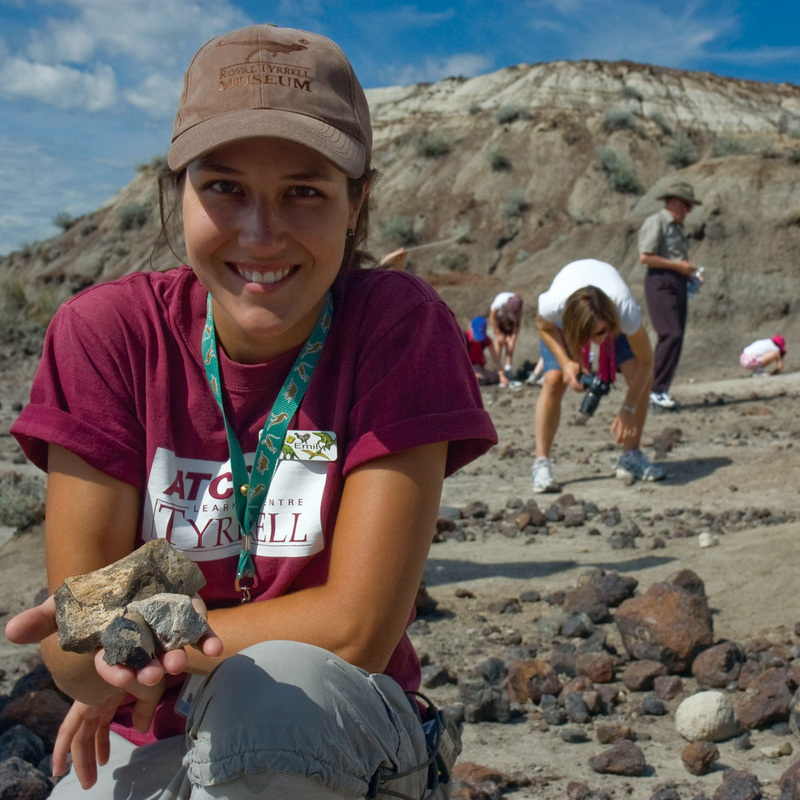 Also consider a tour of Atlas Coal Mine National Historic Site east of Drumheller. From Drumheller drive 145 kms southeast towards Brooks. Dinosaur Provincial Park can be accessed off Hwy # 36 north of Brooks then follow the roadside signs to this UNESCO World Heritage Site. 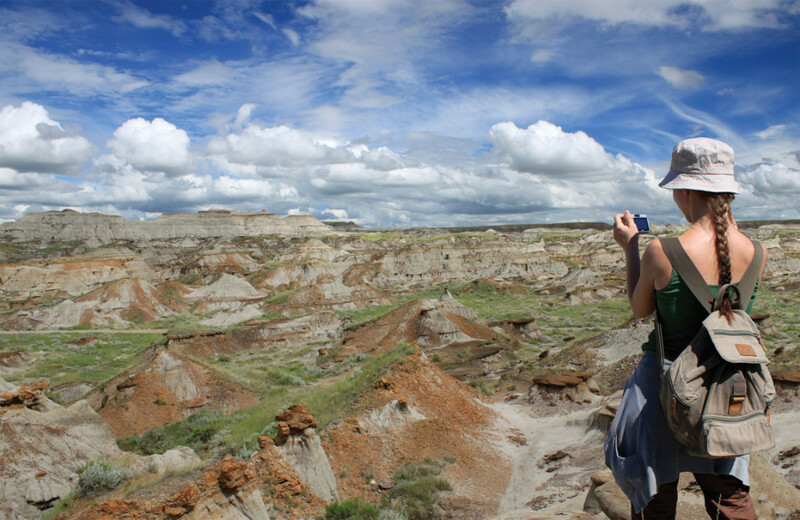 Dinosaur Provincial Park is famous for its fossil finds, engaging experiences, and breath-taking Canadian Badlands landscapes. After leaving the park travel back towards Brooks then drive east of town and follow the roadside signs to Brooks Aqueduct. Dating back one century, Brooks Aqueduct National and Provincial Historic Site is an enormous concrete structure that spans across the parched prairie landscape like a giant centipede. Learn why the Canadian Pacific Railway constructed the Brooks Aqueduct as part of the Eastern Irrigation District. 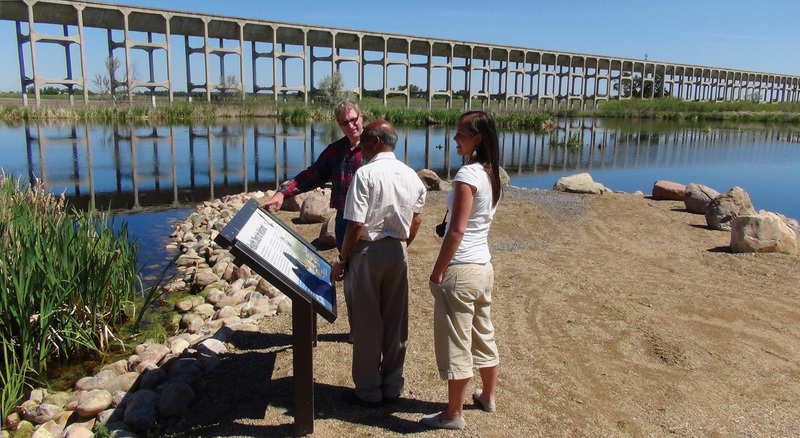 Get your camera ready as you walk along the new wetland interpretive trail and listen to red-winged blackbirds in their natural habitat. After a full day of adventure chow down and overnight at one of two Canalta Hotels in Brooks. Next morning, travel towards Calgary on Hwy #1. Turn south onto Hwy #842 that will take you to Blackfoot Crossing National Historic Site. 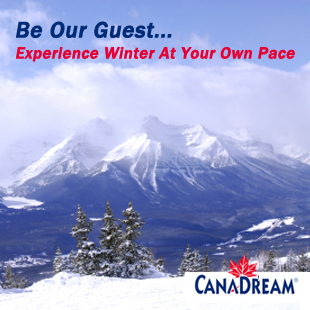 Tour the interpretive centre and try their native cuisine before the final leg of the journey back to Calgary. The Crown of the Continent tour starts in Calgary with visits to heritage attractions then continues south into Blackfoot territory where cultural experiences are as varied as the natural landscapes. Your first stop will be Heritage Park Historical Village on Heritage Drive in southwest Calgary. 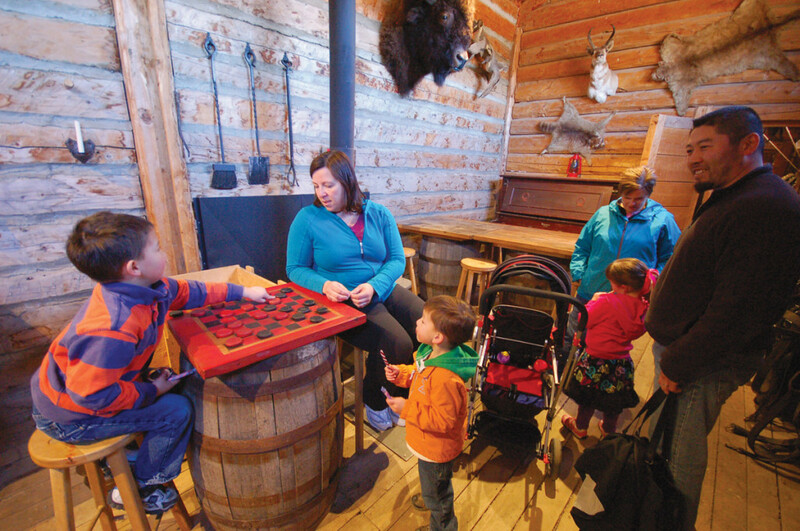 Discover How The West Was Once!® at Heritage Park Historical Village. With a thundering steam train, paddle wheel boat, antique midway, roving theatre group, delicious treats, and an ever-changing cast of village characters, you’ll be captivated by the past like never before. During your visit, explore Heritage Town Square, a 1930s style urban streetscape located just before the Heritage Park gates. Stroll through four vintage-inspired shops, have a photo taken at the Antique Portrait Studio, experience automotive history at Gasoline Alley Museum, and savour Canadian cuisine at the elegant Selkirk Grille. www.HeritagePark.ca 403-268-8500 When travelling south consider an overnight at one of the Canalta Hotels in High River. Drive south on Hwy #2 to Head-Smashed-In Buffalo Jump, located above a vast stretch of wind-swept prairie on Highway #585. The site features a sandstone cliff embodying 5,700 years of dramatic history. 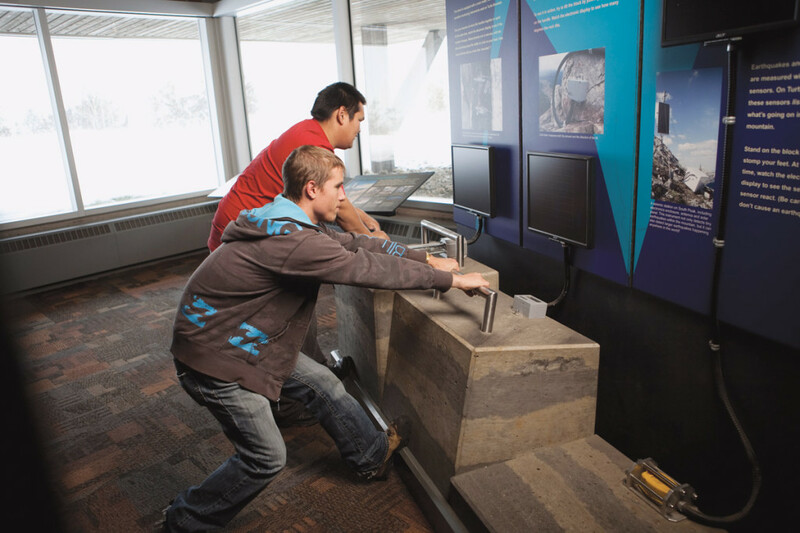 Built right into the escarpment, you can tour the five-level interpretive centre. Hear stories told by Blackfoot guides of the ancient buffalo hunting culture, where the Plains People relied on the buffalo for almost everything they needed to survive. The complex organization of this communal buffalo harvest provided food, shelter, clothing, and tools for an industrious people. Fort Museum imagine eight magnificent horses charging full speed straight at you. Hear the battle cry of the riders dressed in 1800’s North West Mounted Police scarlet tunics, with lances lowered for the attack. 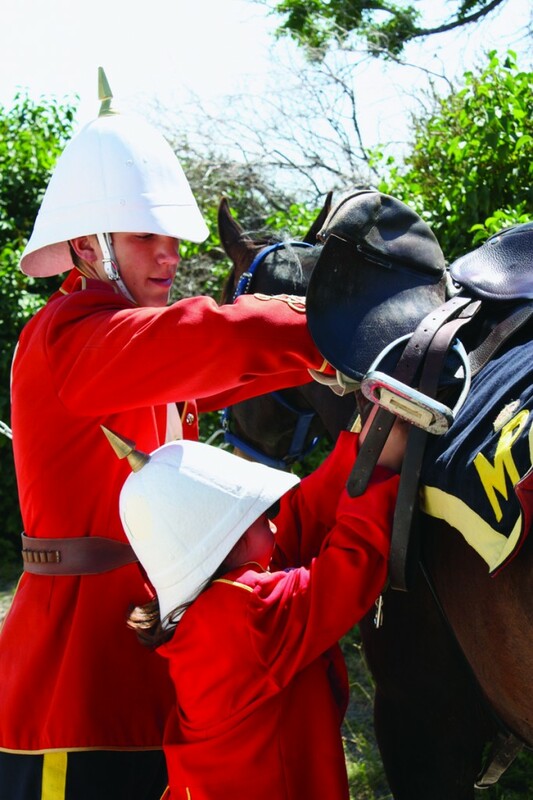 You can slip on the scarlet red and gold trimmed Mounted Patrol Serge, complete with pith helmet, and be part of the Fort’s “Groom a Horse” program. The musical ride is just one of the exciting experiences awaiting you. From Fort Macleod drive 50 kms. east towards Lethbridge on the Hwy #3 where there is a variety of accommodations. Next morning visit Fort Whoop- Up National Historic Site. Built in 1869, Fort Whoop-Up supported a thriving but illegal whiskey trade that attracted American scoundrel traders and the Blackfoot to the Fort, bringing horses and buffalo robes in exchange for whiskey. Taste a piece of fresh fry bread, or something more conventional from the cook shack. 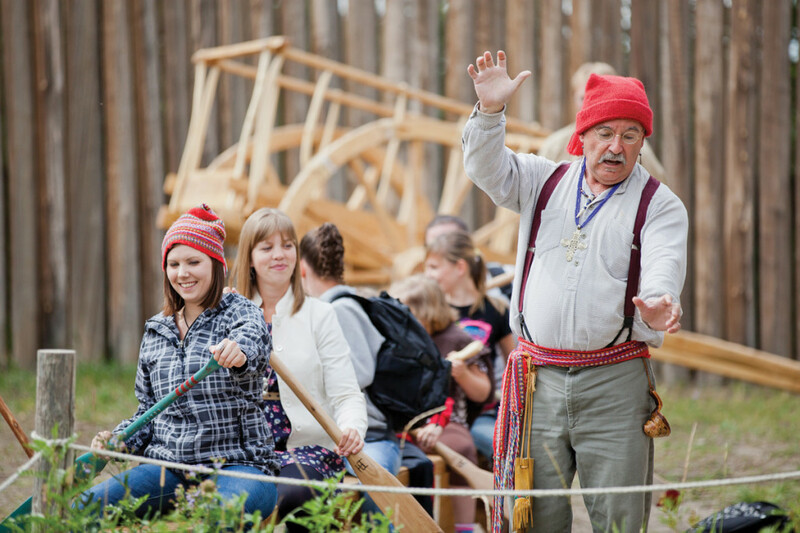 Feel the roll and bump of a wagon ride while touring the river valley, try your skills as a blacksmith, or sit in on a storytelling session. Also in Lethbridge, stop by the Galt Museum to learn about of southern Alberta’s human history. From Lethbridge travel southeast on Highway #4 to Milk River then east on Hwy # 501 to the sacred landscape of Writing-on-Stone/Áísínai’pi. Stop into the visitor’s centre or book a tour of the First Nation petroglyphs (rock carvings) and pictographs (rock paintings) in the park. 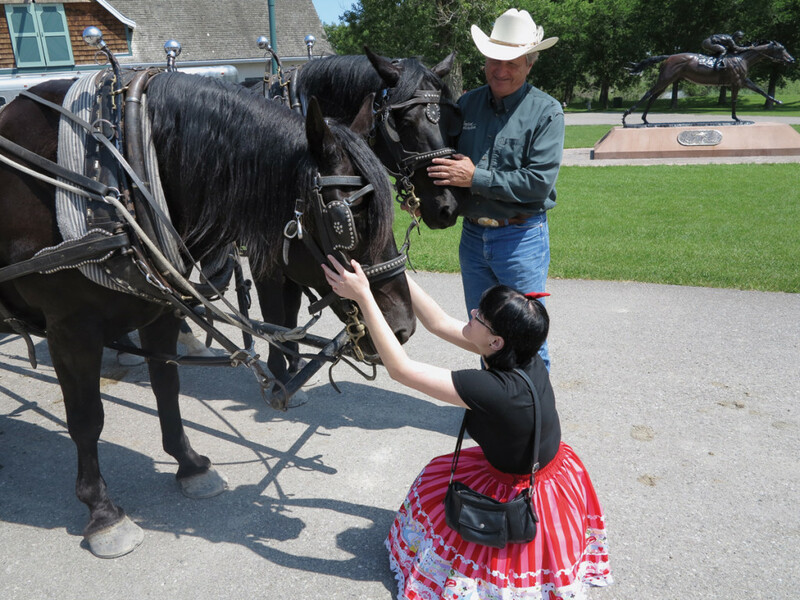 From Writing on Stone travel west along Hwy # 501 to Cardston and visit the Remington Carriage Museum. Participate in a guided tour of the brilliantly designed galleries in the world’s largest carriage museum. Discover over 250 authentic horse-drawn vehicles. Each display tells a vivid story, such as a caboose which carried farm children to school over snow covered roads or the Concord stagecoach a vehicle type made famous by the Hollywood westerns. You can see how these vehicles are conserved in the Museum’s restoration shop. Visit four-legged friends in the stable, and of course take a carriage ride. From Cardston, travel west along the Cowboy Trail to Waterton Lakes National Park. This UNESCO World Heritage Site is known for the diverse plant life and frequent wildlife viewing. Known as Canada’s hiking paradise, you can find high mountain lookouts to take that amazing picture of Waterton Lake, the Prince of Wales National Historic Site, or of the abundant wild flowers. Heading north on the Cowboy Trail spend the night at Canalta Ramada in Pincher Creek. 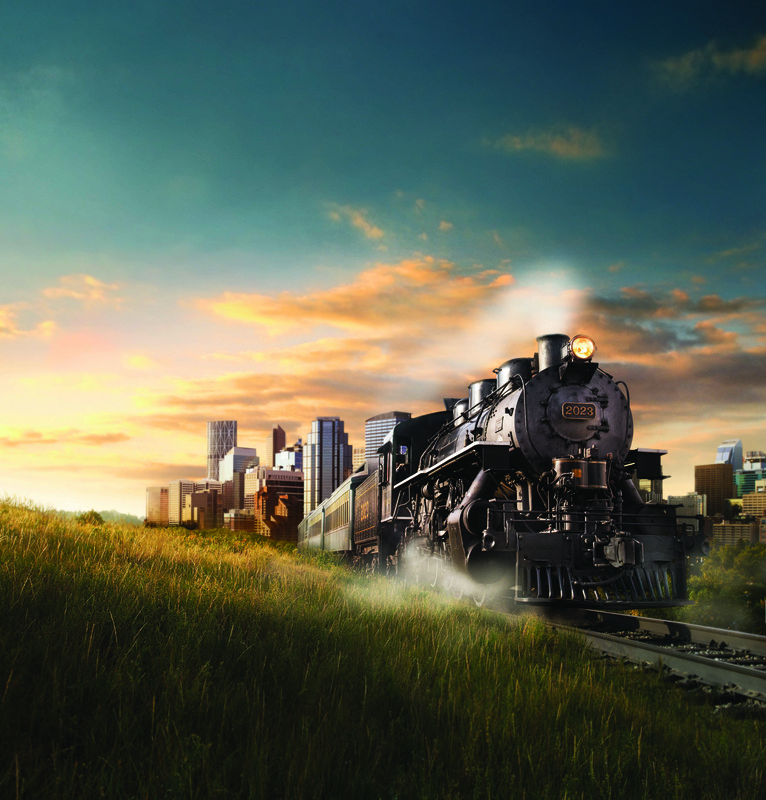 The next morning the journey continues west towards the Crowsnest Pass to connect with nature and industry as you explore the preserved ruins at Leitch Collieries Provincial Historic Site. Canada’s deadliest rockslide. At the Centre hear the extraordinary tale of the night in April 1903 when 82 million tonnes of rock came crashing down from the side of Turtle Mountain, burying a portion of the mining town of Frank forever. Guests discover why the mountain fell and learn about its geological history. Friendly staff members weave tales of the area’s coal mining history and convey stories that visitors never forget. From the Crowsnest Pass, travel back to the Cowboy Trail, Hwy #22 heading north up to the Bar U Ranch National Historic Site that commemorates the history and importance of ranching in Canada. From there complete your journey back up to Calgary. This will be a trip you will not forget.